*3.01 Update – 2nd Round 2.5 Bingo Event Winners announced! Click Here! *There are no more Bingo Rounds at the moment! *2.01 Update – 2nd Round 2.5 Bingo Event Winners announced! Click Here , In order to enter for the 3rd (last) Bingo Round, please submit your Bingo Cards before February 20st, 2011 (They will announced the winners on February 28th, 2011). *12.30 Update – 1st Round 2.5 Bingo Event Winners announced! Click Here , In order to enter for the 2nd Bingo Round, please submit your Bingo Cards before January 20st, 2011 (They will announced the winners on January 31st, 2011). *11.17 Update – A new bingo round has started! The 1st round of the Season 2.5 Bingo Event started on the 8th November and will close on the 20th December. All previous Bingo Cards (Season 1 and 2) can be completed and sent to Daewon Media as entries into the Bingo Events. 1. What is Bingo Card? 2. How do you play/complete the Bingo Card? Back of the Card: there is 1 colour mini-picture printed at the top-right corner (every Bingo Card have different pictures). If you’ve played Bingo before, you should know how the game works – when you have a line/row (either vertically, horizontally, diagonally) of 5 consecutive pictures together, you are a winner (but if you want greater/better prizes, you might want to complete more lines/rows)!! 3. What do I do with my winning Bingo Card? This is the new/exciting part (sorry if I bored you to death with the previous 2 steps ><). In order to have a chance to win something fabulous (autographed goodies), you’ll have to sent your winning Bingo Card(s) to Daewon Media, who were the makers & publishers for the Star Collection Cards! 4. When should I submit it? Season 2.5 will have 3 rounds. 5. I’ve submitted my entry for the Bingo Event. How do I know if I am a winner, and how do I receive the prize? – At the end of every round of Bingo Event (usually the last day of the month), Daewon Media will post an official Winning List on their Trading Card Announcement Page. 6. What are the Prizes for the Bingo Event? 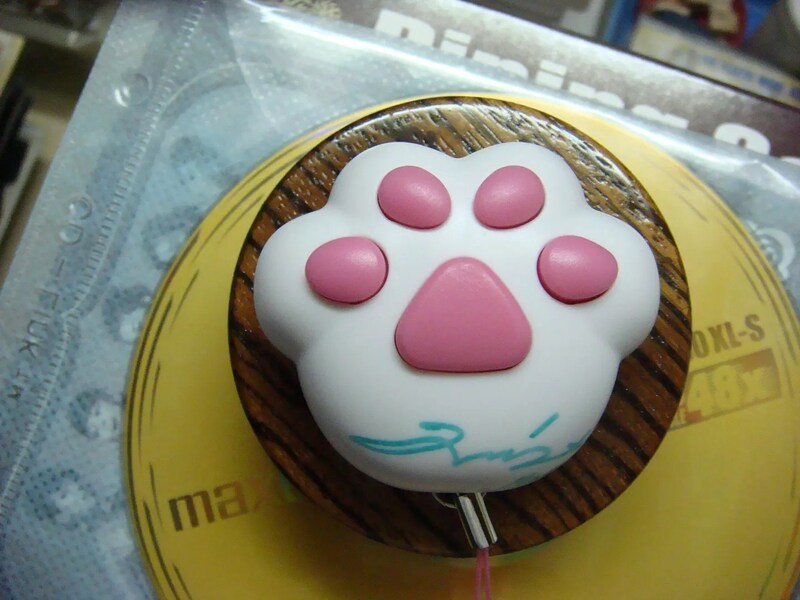 1 Line: Kitty cat paw-print phone strap? -> If you have any questions/concerns, welcome to comment/reply in this page. Do i need to attach the cut outs on the card or just put them into a small bag before? So i should be able to send 1 entry per prize level? By stick it I guess tape would be the best? Hesitant bout using glue. As long as the receive it on monday is ok right? i noticed a slight problem with the first image on the last row. The image is of one of the members in a seated position with her hand towards her face. the image i find in the set is one of the members standing with her hand extended. Is this a mistake? For the 1st image of last row (Yoona sitting down blowing a whistle or something), the image on the Game Board is actually different from the actual piece (which is Yoona holding an album in front of the Album Shelf). You can refer to my ‘Perfect’ Bingo Card for the image. I was wondering about this Bingo event. Is there any chance that they will open the event again? There are still a lot of star cards out there right… then the bingo card will ultimately be useless? I just checked the Daewon website, and apparently they are having another round (4th Round) of Bingo Event! Submit your cards before October 21st and your name will be included in the 4th (and last?) round for Season 2 Bingo Event! Yep that’s me. Thanks for all your help with answering my questions. I was totally shocked to see my name as a winner. Gonna submit the cards i couldn’t finish for the 4th drawing. you got it. I’ll definitely keep you posted. Did they contact you via email or just mail the item to you? the 4th round has opened ^^ your entries must be received by the 21st October. more details are above 🙂 good luck! Wow~ Thanks for the info~ Can we send in Season1 cards? Can we still send in Season 1 cards? Wait, so there will be no more drawing for season 2? But there will be in season 3? Well in season 3 do they still accept ss1 and ss2 bingo cards? Can’t wait for season 3. I hope that means season 3 isn’t too far behind. Hi, I am so happy to see so many others winning Bingo event. Thanks for the information Tom. I wish I had come across your post earlier, so I did not have to figure this out on my own and trust me it was not fun. What did you all won? I won during the second drawing. I was so happy to receive the prize. Although I do have to say Daewon really did a bad job packaging it. My prize did not even come with a picture of proof. I tried to contact them by phone and I got no where (since I cannot speak Korean). The funny thing is the guy who won Tiffany T-shirt they just send him a two line prize picture, but atleast he got a picture. If someone is welling to help me, please let me know. Thanks. but holy crap… that means there's going to be a season 3 before the end of the this year. NOOOOO i'm not even done with season 2!! There are many people selling overpriced bingo event prize on eBay. I wish a real fan would wins it instead. I would love to trade with someone who won Yoona’s signature prize. Third drawing one of my friend won the consolation prize. I would love to know how someone sending 40+ four lines envelope end up with a consolation prize. I won the Two line prize for the Third drawing, now I am just waiting to see who I will get. 30 Perfect, 30 five lines, 30 four lines, 10 three lines, 10 two lines, and 10 one lines = total of 120 envelopes for the drawing. I won only one 5 line prize. Yeah, i would never sell my bingo item. It’s totally unique and very meaningful since i bought the cards, cut & pasted it all night, and won. I keep running to my mailbox every day to see if anything came. lol. the wait is killing me. Just got my 2 lines prize in the mail. I got Hyoyeon’s signed Towel and a blue pom-pom. It is so nice and she look great in the picutre. If a Hyoyeon fan got Yoona stuff maybe we can trade =) I did get a picture this time, I guess I really have to find a way to talk or email Daewon again to find out why I did not get a picture for the 5 line prize. Thats great! What state or country do you live in? Wah, i can’t wait to get mine. Hope its tomorrow! I live in Taiwan. My friend got his consolation prize yesterday, I got my today. Good luck, I hope you get it soon =) Now I am just waiting for my Two genie cards from US and Malaysia to complete my set. Congrats! Hey Tom (it feels weird calling myself ><), do you mind taking some pictures of your prizes and sent it to my e-mail (lovetwins885@hotmail.com)? I really want a decent update of the prizes from this tutorial. sure thing Tom. i’ll keep ya posted on what i get. just picked up my tiffany signed headphones from the post office today. Congrats on winning the earphones? Do you mind sharing some pics of your prize (please sent it to: lovetwins885@hotmail.com)? really thanks for the information, have been heard people using bingo cards to get some autographed items !!! btw, u mention on the 10.02 update all other bingo cards received after september 21st will bring forward to season 3 draw? does it have a specific date that when will the closing date for it?? is it october 21st?? btw, one more question, can i send the sticked card with the edges piece cut out?? which means like i have cut out the edges of it and i stick the other cut out in the front page of the cut out cards. @_@ sorry for it if i made any confusion @_@ too be simple, can i send something like what you show us on the image “perfect bingo cards” but with the top right edges cut out? btw, do you buy the bingo cards or u buy those booster to get it?? curious about where you get that much of bingo cards !!! haha. I got all my Season 2 Bingo cards from booster packs (Since I brought around 17 sets, I have 225 Bingo Cards to play ><). OMG 17 sets. theres 255 cards. crazy. would you suggest to buy from others?? have you send out all the 255 cards?? I am not sure if there is anyone that is just selling just the Bingo Cards nowadays, but it really saves you a lot of time & money from collecting all 25 pieces from the regular booster packs (I think you’ll get one perfect in 5-6 sets). I bought a hyoyeon signed item form the bingo event from ebay. I spent $180, do you think that’s suitable? If you like Hyoyeon then it is a great price=) Her signature is really cool. Do they still accept season 1 bingo cards? do you know how many rounds of drawings they will hold? MAKES ME SUPER EXCITED FOR MY 2.5 STARCARDS! Hey I would like to ask for the bingo card what is considered 2 lines? Could we have like an L shape? Would that be considered 2 lines since one is reused at the bottom? 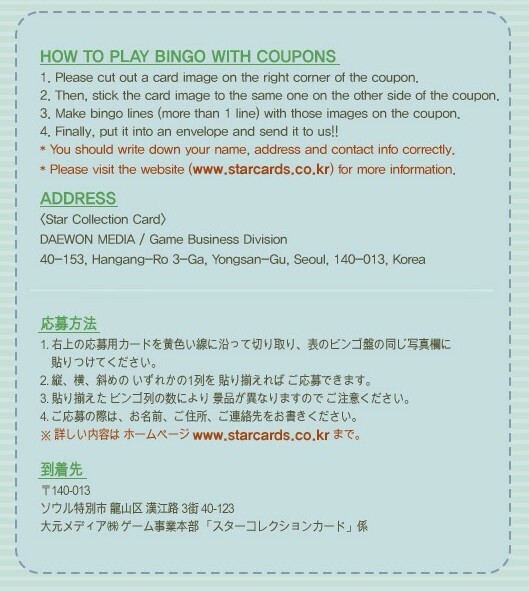 Hello, should I send the Bingo Cards by writing the address of Deawon Media in Korean or in English. Thanks. what if i only have 1 line?? 2. For my case, I stick a mini Post-it notes with my personal information on the back of each Bingo Card (the side of the Korean instructions). Although it is tiring to write/print all the post-it notes and stick it to every Bingo Card, it ensures that the staff will enter your name for every Bingo Card you submitted. Hopefully you’ll receive it soon (usually within a week, since they use EMS as the shipping method) and I hope you could take a picture of the Kitty Paw if possible and share it here! There was no pic with it, is it normal ? What happen if my name is on this list but didn’t received any email from them? I just checked the latest list of winners for the 2nd round Star Cards 2.5 Bingo contest and, guess what, I WON a kitty paw mobile device 😀 😀 😀 !!!! I almost thought I’d blown my chances since I’d only sent in 1 card and failed to see my name in the 1st round winners list ;). I never knew they “snowballed” the entries though for the next round 🙂 ! Thanks ever so much for the on-line tutorial and I’ll try to post a photo of my prize (once I receive it ) here ;). I’ve actually sent in another 1 Line bingo entry, so, second time lucky, maybe 😉 ? !! By the way, on the issue of the spare bingo cards to trade, since I’m no longer wanting to send in any more entries, I’m willing to pass on my spare cards to whoever needs them to complete an entry for the last bingo draw. Drop me a line at (yeo_64@hotmail.com) if you’re keen. Cheers ! Gratz on winning bingo prize. I don’t think they “snowballed” your first entry, maybe when they get it was passed the first entry date. Yeah, I suppose so 😉 . Anyhow, I’m “chuffed to bits” that I managed to win something 😀 ! Thanks for the reply, Tom :). Hey, thanks tom885 😀 ! Sure, I’ll get the photo on-line the moment I receive the item ;). Cheers ! Well, as promised, here are the photos of my 1 line “kitty paw mobile device” prize from Daewon (it arrived today via EMS 😉 ). I think I got Seohyun’s signature on it :D. Cheers ! Thanks tom885 😀 ! Yes, all the best to the participating SONEs in the last Bingo round ;). Cheers ! my username is SNSD SARANG HAE YO!! haha. Hey kenneth, congratz you.. I also received my prize from Daewon Media today, damn happy.. 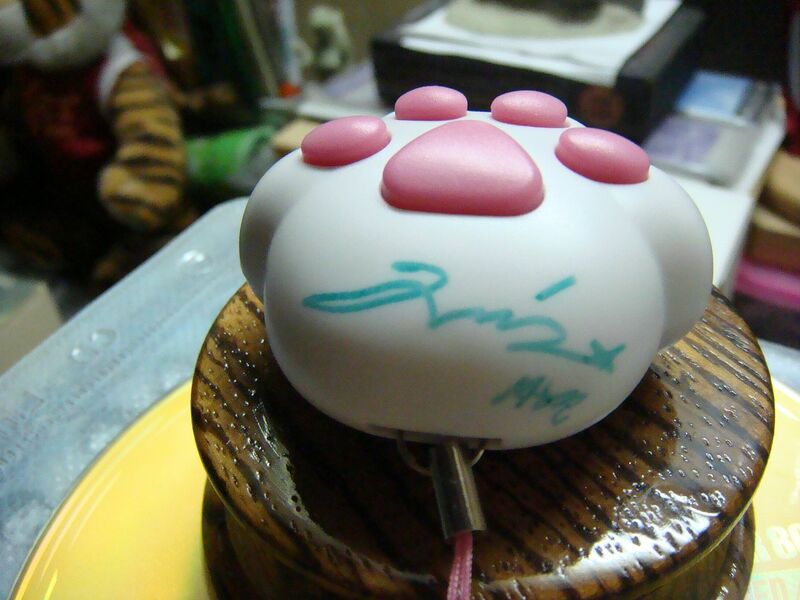 I WON the 1 line kitty paw phone strap with taengoo signature on it.. I send in for 1, 2 and 4 line and cant believe i can win..
Wow, Congrats’ snowiegaizz 😀 !!! I was actually hoping to win the paw with Taengoo’s signature on it ;). Ah well, winning one paw with any of the girls’ signature is good enough, eh ? After all, I LOVE all 9 “angels” equally <3333 🙂 😀 !! !